We all want a bit more experimentation in life these days, whether it’s our wild travel adventures that make for great stories or our ongoing desire to find the most unique place for your social post, and today it’s reached a whole new stage. Now take that experimental thinking and apply it to a house party. Imagine if you could bring your wildest party ideas to life with a little help from an expert. From creating a hot-air balloon light orchestra in the middle of the mountains, to turning the world’s deepest swimming pool into the world’s deepest dance floor, Desperados are experts in igniting the party spirit. UNILAD has discovered one thing that people would change about parties, which is the amount of time we spend staring at our phones. I could tell you that from a Friday night out – everyone sat around with faces in screens. It turns out this is a complaint shared by many and there’s a growing trend of ‘unplugged parties’ that involve people putting their phones down to unplug and let go. This year, Desperados reached new levels of wild experimentation by taking inspiration from partygoers around the world to create a year-long series of acts called ‘Epic Parties Imagined By You’. The first act – which took place in Warsaw, Poland, this weekend – was epic and everyone gave up their phones, resulting in a wild and distraction free party experience. And then some. 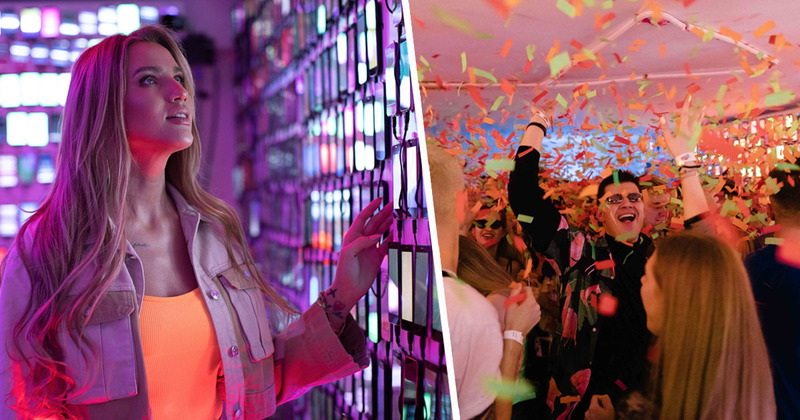 More than your usual Wi-Fi detox, Desperados teamed up with local partygoer, Karolina Gilon, who felt phones were negatively affecting the way people socialise and party. Partygoers experienced the largest ever light show at a house party as 2000 phone screens linked together played animations in time to the music, throwing shapes to change the perspective of the room – proving amazing things can happen when you unplug and let go. By removing phones from the equation, Desperados turned everyone’s attention to the dance floor and the epic house party. When people are constantly on their phones taking photos and videos, it impacts the vibe – especially for the DJ. When you play at a party like this without phones you really notice the difference – it’s next level. With more parties lined up this year, who knows what ideas will be brought to life next. I’m voting for zorb laser tag in full Miami Vice fancy dress with a live soundtrack. Check out more at @Desperados and use #WeAreTheParty to share your party ideas on Facebook, Instagram and Twitter.